Another day indoors, but at least today I’ve felt well enough to work on my notes and do some studying, so it wasn’t such a waste of time. More importantly I have been able to drink litres of water with no ill effects. The magic pills seem to be doing their job! Jenny has been out horse riding in the desert for most of the day and came back with hilarious stories of being attacked by packs of wild dogs and accosted by gangs of wild children from the villages. We had a good laugh about it but I’m sure the dogs at least couldn’t have been very pleasant at the time, snapping and yowling at the heels of her horse. By late afternoon I was actually feeling hungry so Jenny and I went to the Rameses Cafe for an early dinner. Lentil soup for me – one of my favourite Egyptian dishes at any time and with plenty of lemon juice squeezed into it, it should be good for my stomach. Still feeling OK an hour later I decided I would risk venturing over the river with Jenny to Luxor Temple. 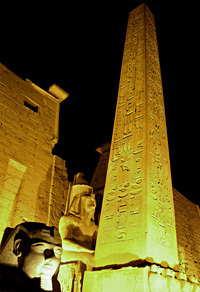 Luxor Temple is one of my favourite places to go in the evening as it stays open until 9.00pm and is floodlit. There are reliefs that will show up under the lights that are sometimes almost invisible by day and the whole atmosphere is very different. In Egypt, darkness comes around 6.00pm most of the year round, so there is plenty of time for a stroll around the temple. With a tripod and fast film in my camera I headed for the ‘Birth Room’ where, on the west wall, there are scenes of the birth of Amenhotep III. The reliefs show the gods Amun-re and Hathor with Amenhotep’s mother Queen Mutemwiya as she embraces her husband Tuthmose IV. Then she is held aloft by the goddesses Selket and Nieth – this is one of the scenes that is badly damaged and almost invisible in daylight. The story unfolds along the wall with the Queen being led to the birth chamber by Khnum and Hathor, where she delivers the baby while seated on a block throne. Khnum has fashioned the ka of the future Amenhotep III on his potter’s wheel and the baby with his ka are then presented to Amun-re by the mother goddesses Hathor and Mut. The baby’s mother Mutemwiya watches while the young prince is suckled by thirteen goddesses, two of which are in the form of cows. He is then presented to many other deities. This relief was carved as proof of the King’s divine birth and his legitimate claim to the throne of Egypt, much the same as Queen Hatshepsut before him, laid claim to the throne in her reliefs at Deir el-Bahri. Walking back through the temple to the Court of Rameses II, I paused to admire the colossal statues of the King and the one remaining obelisk outside the First Pylon, beautifully lit against the dark blue starry sky. The road to Dendera from Luxor follows the East Bank of the Nile northwards towards Qena. There are several small villages along the route, but as we were travelling today with the police convoy there was little time to admire the scenery. We left Luxor at 8.00am sharp with several other coaches and mini-buses as well as a few privately-hired taxis, winding our way through the suburban hamlets before we hit the first checkpoint and then the long straight road towards Qus, the first small town to the north of Luxor. For the first few kilometres the convoy sorted itself out – there is always a race to get to the front, each vehicle overtaking recklessly, often diving back in to the right lane between coaches just before a loaded truck screams past in the opposite direction. This is a two-lane road, but in Egypt everyone drives down the centre until they are forced to one side or the other by oncoming traffic. Drivers with nerves of steel will play a waiting game to see who will give way first and there are horns constantly blaring loudly. Gravel was scattered as the speeding convoy passed a donkey pulling a loaded cart down the edge of the road in the wrong direction and the driver turned and scowled, shouting something as our mini-bus edged past giving the unpredictable animal a wide berth. Our driver didn’t take part in the race to be first, preferring to hang back at a more leisurely pace but he was soon hurried on by a police vehicle for going too slowly, the captain leaning out of his window, waving his arms and shouting at us to get a move on. We sped through small villages, narrowly missing pedestrians trying to cross the road while mothers reached out to grab hold of tiny children and chickens and goats bolted for safety into open doorways. The villagers justifiably hate the convoys as much as I do and I’m never sure if their rage is directed at us tourists or the tourist police, but probably both. When we reached Qena the convoy split up. Most of the coaches were making the journey through the Eastern Desert to Hurghada on the coast while our minibus and a few other vehicles crossed the bridge over the wide river to the West Bank and drove through the fields of sugar cane to Dendera Temple. Although our primary destination today was Abydos, the convoy stopped for a hour and a half at Dendera, so that’s what we had to do. Our French companions, Katrina and Danny, hadn’t been to Dendera before and they rushed off through the great tall gateway and disappeared into the huge facade of the Temple of Hathor to make the most of their visit, while Jenny and I hung back and ambled around away from the crowds. We had taken a day-cruise to Dendera last October, which didn’t feel like very long ago, so we spent most of our time looking at the various structures in the temple precinct, only going into the temple later to climb the winding staircase onto the roof for an overview of the subsidiary buildings. Before long we were back in our mini-bus and on our way to Abydos. Many of the coaches had gone back to Luxor and the convoy now consisted of only half a dozen vehicles and a police truck that was in no particular hurry, so it was a much more leisurely drive. We had crossed back to the East Bank, only to cross the Nile again at Nag Hamadi where the bridge crosses a barrage and the river froths and boils around the massive stone supports below the road. We made a brief stop while the police captain bought some fresh fish from a stall on the bridge before driving on past the tall steam-belching chimneys of the Nag Hamadi sugar-cane factory and after another hour or so, arrived at Abydos. The ancient town of Abydos (Abdju) was traditionally associated with the god Osiris and the religious significance of the site dates back to the very beginnings of Egyptian history when the earliest rulers chose to be buried in the desert necropolis in the sacred cult centre of Osiris. In the myth of Osiris and Seth, after the god was hacked into fourteen pieces by his treacherous brother Seth, Osiris’s wife Isis set out to find the parts of her husband’s body which were scattered all along the Nile. Each piece she found, she buried in a secret place until the body of Osiris could be reassembled. The god’s head had been found at Abydos, according to the legend and this was where Isis finally buried his embalmed body and he once more achieved immortality. Afterwards, Isis remained inconsolable and her grief gave rise to another story that her tears caused the annual flooding of the Nile. Since ancient times the rich and powerful men of Egypt wished to be buried at Abydos where Osiris himself lay and the ancient name Abdju has been interpreted as the ‘Hill of the Emblem’, referring to the grave of Osiris. Whenever I go into the Temple at Abydos I am again awed by the superb colourful reliefs of Seti I and the fact that they have survived so well-preserved for all these centuries. I can stand and look at them for hours and marvel at the workmanship of each carved hieroglyph and the beautiful depiction of the King and the gods in the long columned Osiris Hall at the rear. I also love the dark interior of the Hypostyle Halls with their tall papyrus columns. But today we had only an hour and a half here and as this was Jenny’s first visit we walked right through the temple so that she could get a brief view of each room, before going out to the Osirion behind. Apart from the handful of tourists who came with the convoy, the temple was packed with Egyptian schoolchildren and I have to say I didn’t enjoy the visit as much as I could have done. No doubt I have been spoilt by the few days I spent at here in March 1999 with Robin, when we had the whole temple to ourselves for hours at a time. The only consolation was that Jenny, as well as Katrina and Danny, really enjoyed their time in Abydos and I was very glad we had been invited to share the adventure. We arrived back in Luxor in the late afternoon. Our return journey was uneventful and I’m happy to say was more relaxed than the morning drive had been. We were able to enjoy the countryside with the golden reflection of a sinking sun on the ramparts of the hills that form a boundary with the desert beyond. This morning dawned clear and warm, like a glorious summer’s day in England. Perfect! I was woken early by the call of the muezzin ‘s prayer to discover that a mosque is right next door with a loudspeaker on the minaret pointing straight at our window. While some might find this noisy awakening annoying, I have come to love the gentle sound of the day’s first call to prayer, ‘Allah’u Akhbar’, echoing off the rooftops and merging with other calls from the mosques all over Luxor. It’s a great way to wake up and I knew instantly I was in Egypt. I mused that if an alarm clock was made with this sound I wouldn’t mind getting up in the mornings at home. Jenny and I had breakfast downstairs on the paved terrace next to the tiny swimming pool – which was newly built but not yet filled and I could see that the little garden around it had been planted up so that in a year or two it would be very pretty. A standard breakfast in an Egyptian hotel usually consists of bread (in this case, fresh white torpedo rolls), a hard-boiled egg, little triangles of soft processed cheese and individual pots of fig jam or honey. Sometimes there may be thin slices of a hard cheese and tomatoes and often pickled gherkins or carrot (something I’ve never fancied first thing in the morning). The coffee was instant powdered Nescafe, but being somewhat of a coffee snob I’ve learned never to travel without my real filter coffee bags. With breakfast over, Jenny and I went out to wander around, seeing many local people who recognised us and we were welcomed back by everyone we met. It was one of those mornings of endless cups of tea with the stallholders in the suq, but all we actually bought were bottles of water. After lunch I phoned my friend Robin who now lives here on the West Bank and she met us later in Luxor Temple. Being only five months since I was last here, nothing much had changed in the temple, which in the early afternoon was fairly quiet. Entering through the massive pylon of Rameses II, we wandered the open halls and colonnades through to the southern end, looking at various reliefs on the way. There is always something in every site that I have never noticed before, no matter how many times I’ve visited and today I spotted an Amarna block with a relief of the Aten, stacked with others behind a metal gate in one of the small side chambers. I wonder how it got there. While Jenny and Robin carried on looking around, I went to take pictures in the ‘Birth Room’. Last time I was here I had looked at the detail of the Opet Festival scenes on the walls of Amenhotep’s colonnade. The ‘Birth Room’ however, is deep inside the inner part of the temple and has a sequence of scenes depicting the divine birth of Amenhotep III, rather similar to those of Hatshepsut at Deir el-Bahri. The reliefs are very shallow and worn and also pock-marked by later re-use of the temple, so they are not easy to photograph clearly. This room used to be open to the air and much lighter than it is now with its wooden roof. On the west wall, the lower register shows Amenhotep’s mother, Queen Mutemwiya, sitting on a bed with Amun-re, their divine union having been consummated. Amun-re then instructs the ram-headed god Khnum to fashion the baby Amenhotep and his ka out of clay on his potter’s wheel. The scene above shows the queen with Thoth, being led to the birth chamber by Khnum and Hathor where she gives birth to the ka of Amenhotep while seated on a block throne. The goddess Hathor presents the child to his father, Amun-re, who embraces the boy while Mut and Hathor watch over him. In the register above, Amenhotep is suckled by thirteen goddesses. The future king’s reign length is determined by an assembly of deities. This whole picture of divine birth is a royal propaganda myth, told on the walls of the king’s temple in order to legitimise his reign, just as Hatshepsut did before him at Deir el-Bahri. But the scene may also relate to some esoteric ritual of the Opet Festival, in the form of a ‘divine marriage’ perhaps performed annually here to symbolise renewal and strengthen the rulership. By the time the crowds began to filter back into the temple in the late afternoon we were ready to leave. It was a beautiful evening and the sun was going down over the Theban mountain, setting the river alight with ripples of orange like tongues of flame as we walked around the corner to have a meal together at the Amoun Restaurant. Each Nile cruise I’ve been on has had some sort of entertainment in the evening. Tonight was the weekly ‘galabeya party’, when we passengers were expected to dress up in newly purchased ‘Egyptian dress’ – galabeyas and head-gear – and generally make fools of ourselves – all in the spirit of good fun. After dinner Michael organised a play, enacting the myth of Osiris and Seth which we had seen depicted on the walls at Edfu, earlier that day. Of course the play’s main actors were the most outgoing and outrageous of our group. Geb, god of the Earth and Nut, goddess of the sky, produced four children, Isis, Osiris, Seth and Nephthys. Osiris, as the firstborn son, was given the right to govern the land of Egypt. He married his sister Isis. Their brother Seth however, known as a bit of a rebel, was jealous of the success of King Osiris of Egypt and set about plotting his assassination. Seth constructed a fine chest and at a banquet he tricked Osiris into lying in the box, which he quickly nailed down and threw into the Nile. When Isis heard of her husband’s death (while she was in the town now known as Coptos), she set about looking for the chest and the body of Osiris, eventually hearing that it had been washed ashore in the land of Byblos. The coffin landed in a tamarisk tree which grew around it and was eventually cut down and made into a pillar for the palace of the king (this later became the origin of the djed pillar, symbol of strength). Isis travelled to Byblos and gained a reputation with the ladies of the court for being a great healer and was given the pillar as a gift in return for her services. Isis had the chest containing the body of Osiris hewn out of the tree trunk and she sailed with it back to Egypt. When she arrived in the Delta, Isis opened the coffin and she and her sister Nephthys tried to revive the body. Egyptian legend tells that the goddesses breathed life and warmth into the body of Osiris enough for him to be able to impregnate Isis with their son, Horus, who she hid for protection in the northern papyrus marshes until he was grown. Meanwhile Seth was still worried that Osiris would return again to disrupt his own assumed rule of Egypt. He found the embalmed body and had it cut into fourteen pieces, which he scattered throughout Egypt. Once more Isis set out to find the scattered parts of her husband’s body, sailing up and down the Nile attended by the birds and beasts, who loved her. Eventually Isis found all but one of the parts of Osiris’s body. The goddess pretended to bury each part of her husband’s body where she found it, explaining the many shrines to Osiris found throughout Egypt. What she actually did was to take the body to Horus who, with the help of Thoth and Anubis, reassembled it, except for his ‘manhood’ which had been eaten by a fish. The body of the god Osiris was buried at Abydos, where he became once more immortal. Horus spent his life avenging his father Osiris, in the pursuit of his enemy Seth and there were many battles fought. Seth took many guises, especially the crocodile and hippopotamus. He could call up violent storms at will and had a great voice like thunder. One of these battles was fought at Elephantine Island (Aswan) when Seth took the form of a red hippopotamus and used his storms as a terrible weapon. In the last battle, Seth was overcome by the young god Horus, who killed him with a harpoon, avenging the humiliation of his father and bringing peace at last to his mother. At Edfu, the tradition of Horus’s triumph over Seth can be seen in the ‘Edfu Drama’ reliefs on the ambulatory wall. The drama is a universal myth of kingship and resonates throughout the world in many different cultures. It also explains many of the traditions of ancient Egypt seen in different temples up and down the Nile.